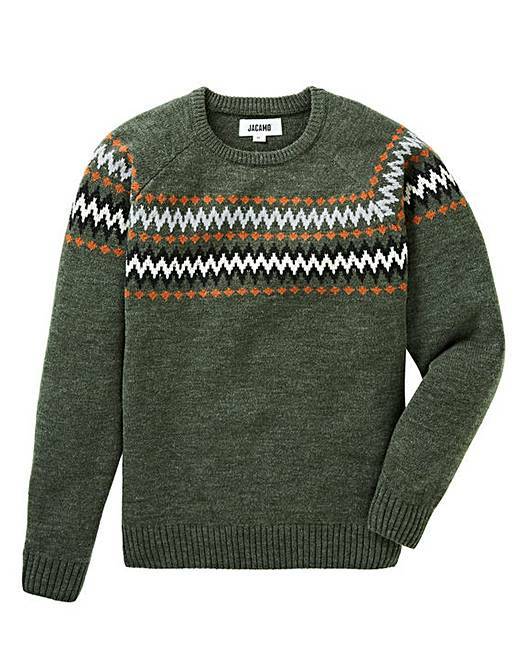 Khaki Fairisle Style Jumper Regular is rated 4.5 out of 5 by 4. Jacamo Unlimited gives you unlimited next day, nominated day or click & collect delivery for £9.95 for 12 months. If your order includes a product to which supplementary delivery charge applies, you will still be charged for these. Where supplementary delivery charges apply these are clearly detailed on the product pages and in your shopping basket prior to placing your order. This offer is only available to individuals residing in the UK and for delivery to UK addresses. You must have a registered Jacamo account and be logged in to your account to take advantage of this offer. 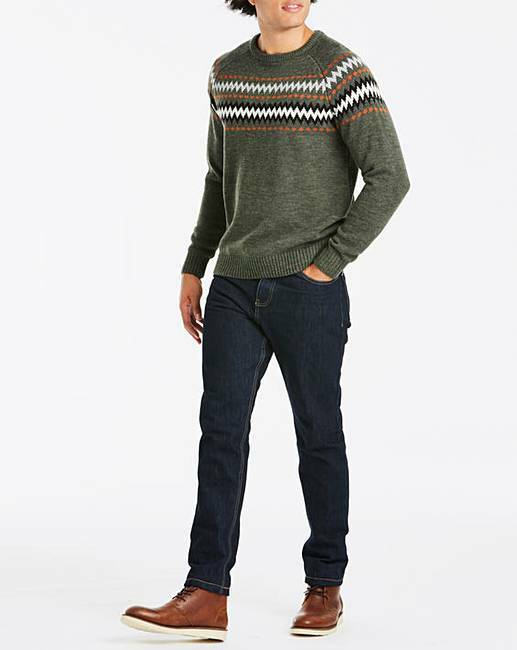 By purchasing Jacamo Unlimited you expressly accept that we will start to provide you with the benefits of Jacamo Unlimited from the date of purchase. You may cancel Jacamo Unlimited at any time within 14 days from the date of purchase by contacting us on 0345 071 9018. If you have not placed any orders with us during this period, we will issue you a full refund. However, if you or anyone authorised by you to use your account has placed an order during this period, we will issue you a prorated refund. Your Jacamo Unlimited purchase is subject to acceptance by Jacamo. We reserve the right to amend the Jacamo Unlimited terms and conditions at our discretion and we will inform you of any significant changes. 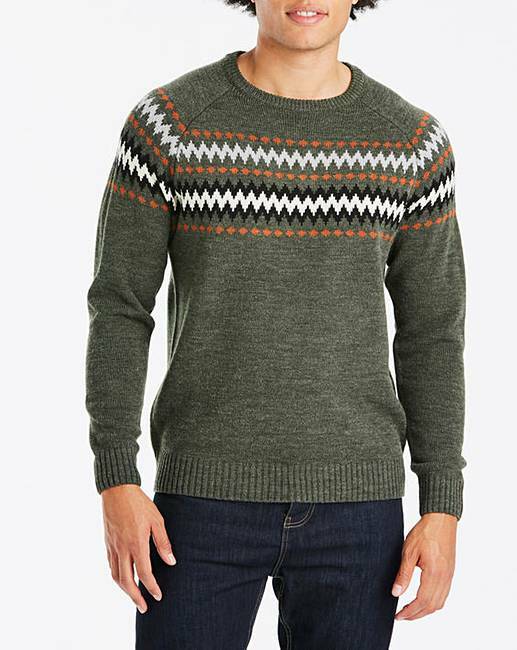 This Fair Isle-style jumper from Jacamo is perfect for any autum/winter wardrobe. Team with a pair of jeans and trainers or brogues. Next Day Delivery £0.00 plus your standard charge*. Nominated Day Delivery £0.00 plus your standard charge*. Hermes Parcel Shop £3.99 * Free for orders over £40 otherwise standard delivery charge applied. Direct Express £1.99 (£1.99 if you have already selected next or nominated day delivery) plus your standard charge**. We aim to deliver your order the next working day for orders placed on a Jacamo account before 6:00 PM, providing items are in stock at our own warehouse. Northern Ireland orders, larger items or items sent direct from our suppliers will take a little longer. Rated 4 out of 5 by Jacko from Very nice jumper I bought this jumper and also the navy one. My husband is very pleased with them , they are true to size and look very nice on. Rated 5 out of 5 by pennyj from Good quality I bought this as a present for my partner and he loves it. It is so thick and warm for the colder days.